One of the most important operations for all data structures is searching for the elements from the stored data. There are various methods to search for an element in the data structures; in this article, we shall explore the interpolation search strategy that can be used to find elements in a collection of items. The source code used in this article is available at https://github.com/PacktPublishing/Hands-On-Data-Structures-and-Algorithms-with-Python-3.7-Second-Edition/tree/master/Chapter09. The interpolation searching algorithm is an improved version of the binary search algorithm. It performs very efficiently when there are uniformly distributed elements in the sorted list. In a binary search, we always start searching from the middle of the list, whereas in the interpolation search we determine the starting position depending on the item to be searched. In the interpolation search algorithm, the starting search position is most likely to be the closest to the start or end of the list depending on the search item. If the search item is near to the first element in the list, then the starting search position is likely to be near the start of the list. In the preceding formula, the lower_bound_index variable is the lower-bound index, which is the index of the smallest value in the input_list list, denoting the index position of the lowest value in the list. The input_list[lower_bound_index] and input_list[upper_bound_index] variables are the lowest and highest values respectively in the list. The search_value variable contains the value of the item that is to be searched. To find 120, we know that we should look at the right-hand portion of the list. Our initial treatment of binary search would typically examine the middle element first in order to determine if it matches the search term. The nearest_mid function takes, as arguments, the lists on which to perform the search. The lower_bound_index and upper_bound_index parameters represent the bounds in the list within which we are hoping to find the search term. Furthermore, search_value represents the value being searched for. It can now be seen that the mid_point value will receive the value 5. So, in the case of an interpolation search, the algorithm will start searching from the index position 5, which is the index of the location of our search term. Thus, the item to be searched will be found in the first comparison, whereas in the case of a binary search, we would have chosen the position of 100 as mid_point, which would have required another run of the algorithm. One can see that the midpoint is actually standing approximately in the middle of the preceding list. This is as a result of dividing the list by two. In an interpolation search, the midpoint is generally more to the left or right. This is caused by the effect of the multiplier being used when dividing to obtain the midpoint. In the preceding diagram, our midpoint has been skewed to the right. The implementation of the interpolation algorithm remains the same as that of the binary search except for the way we compute the midpoint. The nearest_mid function makes use of a multiplication operation. This can produce values that are greater than upper_bound_index or lower than lower_bound_index. When this occurs, it means the search term, term, is not in the list. None is, therefore, returned to represent this. So, what happens when ordered_list[mid_point] does not equal the search term? Well, we must now readjust index_of_first_element and index_of_last_element so that the algorithm will focus on the part of the array that is likely to contain the search term. If the search term is greater than the value stored at ordered_list[mid_point], then we only adjust the index_of_first_element variable to point to the mid_point + 1 index. 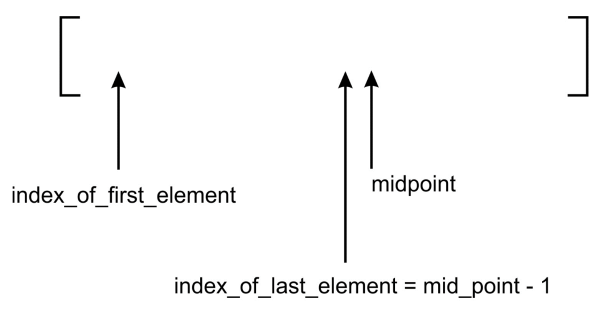 The diagram shows the effect of the recalculation of index_of_last_element on the position of the midpoint. Let's use a more practical example to understand the inner workings of both the binary search and interpolation algorithms. At index 0, the value 2 is stored, and at index 7, the value 77 is stored. Now, assume that we want to find the element 2 in the list. How will the two different algorithms go about it? As we get the mid_point value 0, we start the interpolation search with the value at index 0. Just with one comparison, we have found the search term. The first mid_point value calculated is 3. The second mid_point value is 1 and the last mid_point value where the search term is found is 0. Therefore, it is clear that the interpolation search algorithm performs better than binary search in most cases. The binary search and interpolation search algorithms are better in performance compared to both ordered and unordered linear search functions. Because of the sequential probing of elements in the list to find the search term, ordered and unordered linear searches have a time complexity of O(n). This gives a very poor performance when the list is large. The binary search operation, on the other hand, slices the list in two anytime a search is attempted. On each iteration, we approach the search term much faster than in a linear strategy. The time complexity yields O(log n). Despite the speed gain in using a binary search, the main disadvantage of it is that it cannot be applied on an unsorted list of items, neither is it advised to be used for a list of small size due to an overhead of sorting. The ability to get to the portion of the list that holds a search term determines, to a large extent, how well a search algorithm will perform. In the interpolation search algorithm, the midpoint is computed in such a way that it gives a higher probability of obtaining our search term faster. The average-case time complexity of the interpolation search is O(log(log n)), whereas the worst-case time complexity of the interpolation search algorithm is O(n). This shows that interpolation search is better than binary search and provides faster searching in most cases. If you found this article interesting, you can explore Hands-On Data Structures and Algorithms with Python to learn to implement complex data structures and algorithms using Python. Hands-On Data Structures and Algorithms with Python teaches you the essential Python data structures and the most common algorithms for building easy and maintainable applications. Last updated: 2019-02-17 Sun 11:21.